Laminitis is a huge topic, there is no way I can cover everything a person would want to know about it, but I feel an overview is important. If you have unanswered questions, please feel free to contact me. Laminitis is a sign that something is wrong, rather than a discrete disease. There are a number of causes of laminitis that will be discussed later, but all of these causes lead to some form of disruption within the hoof capsule. The word laminitis technically means inflammation of the laminae, but we expand it to mean inflammation of the blood rich soft tissues of the hoof, this definition includes the laminae themselves and the sensitive parts of the sole, coronary band, periople and frog. 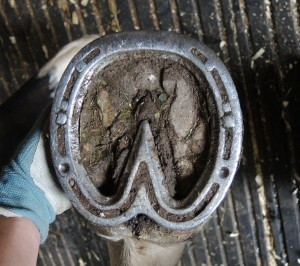 Widening the definition this way allows us to better understand the effects on the hoof, and why some horses show different signs to others, but respond to similar treatment and prevention routines. There is a common misconception that a horse only has laminitis once rotation or sinker of the pedal bone has occurred, and that if the horse is not rocked back onto its heels in the “typical laminitis stance” it is not suffering from laminitis, many horses with mild inflammation will actually stand with all four feet underneath the body in what can be termed a “goat on a rock” stance (a healthy horse with comfortable feet should stand with the cannon bones vertical). In actuality, inflammation is inflammation, whether it is a small amount or a large amount. Low level, long-term inflammation (medically described as chronic) can cause as many problems, if not more, as a single acute event that results in the laminitic rocked back stance. Some of these causes are definite points in time that can be identified and hopefully avoided in the future, but others will require careful ongoing management to prevent recurrent attacks. How do we treat acute laminitis? Identification of the cause and prevention of further attacks. 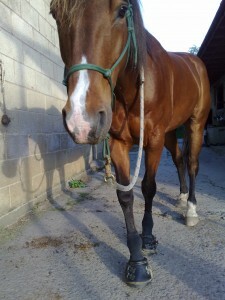 Our most immediate concern when a horse comes down with laminitis is not how did he get it, but how can I make him more comfortable? 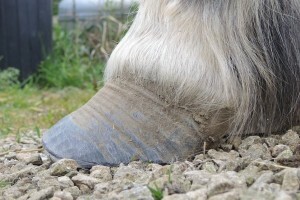 Acute Laminitis is a veterinary emergency and can only be diagnosed by a vet, but trimmers and farriers who see your horse on a regular basis may be able to pick up subtle signs that all is not right within the hoof (especially with Endocrine related laminitis) and this could prevent an acute attack if management changes are made. Call the vet – the vet will be able to prescribe painkillers to ease the discomfort of the horse and may want to x-ray the feet. Call your hoof care professional – your hoof carer will work alongside your vet to help make the horse as comfortable as possible with corrective trimming, and to help recover the hoof capsule to allow return to work. Ongoing care of the hoof will be determined between your vet and your hoof care professional, but is likely to take one of two directions, supportive foam pads, held on by duct tape or hoof boots, or the use of heart bar shoes, possibly with infill material applied. 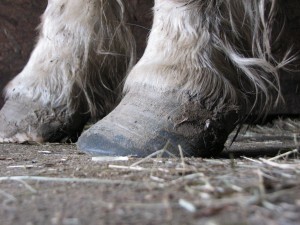 Either way, expect to be seeing your hoof carer on a very regular basis initially as the hoof will respond to the trauma by growing very quickly and will be in need of frequent trims. As an Equine Podiatrist, my preferred solution is supportive styrofoam pads held on with hoof boots, but if your vet insists on shoes, I can still help you with the second stage of the process – the identification of the cause and prevention of future attacks. In the longer term, there is no reason why your horse can not go back to a barefoot lifestyle even if shoes are used immediately after an acute attack. Some horses seem to rumble on with laminitis for years. This does not have to be the case. As long as we can identify the likely cause of the problem, there is every chance we can create a management routine that will help your horse to be more comfortable and ultimately return them to a happy riding career. With chronic laminitis, it appears that the most likely cause is a medical issue known as Insulin Resistance. Insulin is vital in the body for controlling blood sugar levels and converting blood glucose into energy used by the cells in the body. Insulin Resistance is where the cells become less sensitive to insulin and therefore require more insulin to process a given amount of glucose in the blood stream. Your vet can test for insulin resistance, and if your horse is suffering regular bouts of laminitis or if your hoof carer suggests that its feet show the typical signs of laminitis then it would be worth having a discussion with your vet. Once a diagnosis has been made, a management plan can be put in place. This plan may include drugs (especially important if Cushing’s Syndrome is suspected), dietary changes including restricting grazing and supplements plus exercise when the horse is not suffering a bout of laminitis. Exercise one of the most effective elements in managing insulin resistance as it boosts the metabolism, which requires a plentiful supply of blood glucose. This is not to say that being aware what your horse is eating is not important as well in successfully managing the laminitis, it is just made so much easier if your horse is getting plenty of exercise. 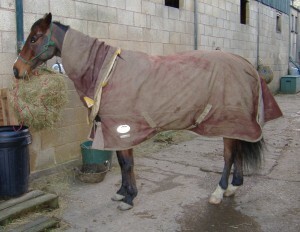 Diet also plays a key role in managing chronic laminitis. If your horse is insulin resistant, it is important to manage the glucose levels within the blood to avoid spikes that may trigger an attack. Certain nutrients are important for glucose metabolism, so ensuring these are available in the diet along with reducing starchy grains and access to grasses high in water soluble carbohydrates can help reduce the incidences of laminitis. If you need advice regarding diet, seek out an independent registered nutritionist rather than contacting a feed company or asking your friends. Feed company nutritionists may well be qualified, but can only recommend a product from their company’s range while another company may have a better or cheaper product, the independent nutritionist will be able to recommend the best product for your horse and your pocket. My preference for boots and pads is not just because this enables me to continue with the hoof care, but because I believe they offer a more flexible solution with regards providing support to different areas of the hoof, and are more hygienic because they can be removed and cleaned regularly while shoes with infill material may stay in place for a few weeks at a time, allowing infection to build up. Pads held on with hoof boots also only apply pressure to the bottom of the foot when the horse is standing on that foot, and therefore release pressure when the horse lifts its foot. Shoes with infill material apply a constant pressure to the sole whether the horse is weight bearing or not. If there is inflammation to the solar corium as a result of the laminitis attack, this could cause too much pressure to be applied, weakening the sole rather than supporting it. Shoes without infill material don’t apply pressure to the sole at all, which can be a good thing (if the sole is extremely tender) but heart bars need to be expertly fitted using recent x-ray images to be of any real benefit. If they are not fitted perfectly they can damage the frog, or can actually encourage the rotation that they are designed to prevent. Having expressed my preference for boots and pads, in order for them to work, they have to be the owner’s preference too! The care of a laminitic equine is not easy; it is an emotional journey as well as a physical one. When using boots and pads, it is necessary to remove the boots every day to check for rubs – if rubbing starts it is vital to take measures to ease any sores and prevent further sores from occurring otherwise infection and pain will be likely. While the boots are off, it is a good time to check the frog and soles carefully (and gently) for signs of infection or tenderness. Thrush can easily be dealt with using a solution of baby sterilizing fluid or zinc oxide cream. If the sole is becoming more tender then it is time to get back in touch with your vet and hoof carer to review the treatment protocol. If you don’t think you will be able to remove and replace the hoof boots daily, and check for sores, then consider shoeing as a short-term recovery option, but work with your vet to ensure your farrier gets the radiographs he needs to correctly fit the shoes.